The Design Hierarchy View presents recursively the instances in a Verilog module or the instances in a VHDL entity or component implementation. Cross-language design hierarchies are also supported. Position the editor cursor on the name of a design element and press Shift+F4 or right-click and choose Show > Design Hierarchy from the context menu. The Design Hierarchy View opens with the chosen element set as the top of the hierarchy. You can also go to menu Window > Show View > Design Hierarchy to open the view. 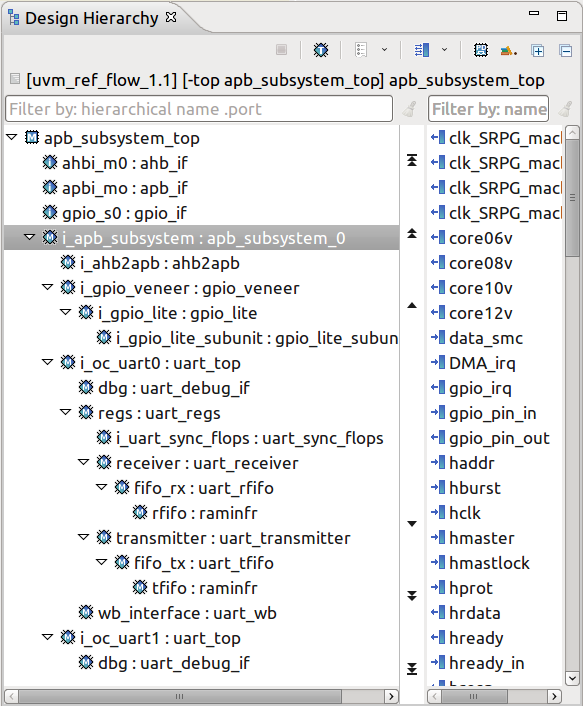 Select Top A drop-down menu/pop-up dialog to select from top modules for Verilog or top architectures for VHDL. For Verilog, a top element is a module that instantiates other design elements and it is not itself instantiated. Similar for VHDL top architectures. History List Click to see the previously inspected elements. Show Connect Toolbar Show or hide the connect instances toolbar. More details here. Show/Hide Ports Shows or hides the ports of the selected element. You can set the ports panel to the right or below the hierarchy. Show PD Shows or hides power domain information. You can choose to see the power domain names in the node labels, and distinctive foreground or background colors for all nodes belonging to the same power dmain. Prepend Library Prepend to the node label the name of the library to which the instance belongs. Alphabetical Sort Sort instances and ports alphabetically. By default it is off which means that the instances and the ports are presented in their declaration order in the source files. The view label shows the current project, the current top element and the number of instances in the hierarchy. You can double-click on an instance to go to its declaration. Double-click on a port to go to where it is connected. Show Design Hierarchy Show the design hierarchy starting from the selection. Copy Copy the label text of the selected instance to clipboard. Connect Output See Connect Instances Using New Ports. 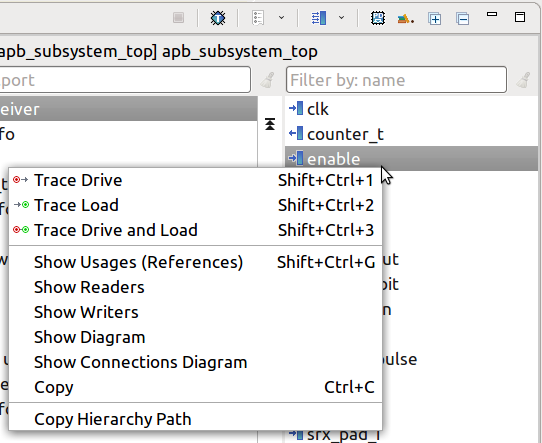 Copy Hierarchy Path Copy the hierarchy path of the selected instance to clipboard. You can change the segment separator from Window > Preferences > DVT. Trace Drive / Load / Drive and Load / In Subinstance See Trace Connections. Copy Copy the label text of the selected port to clipboard. 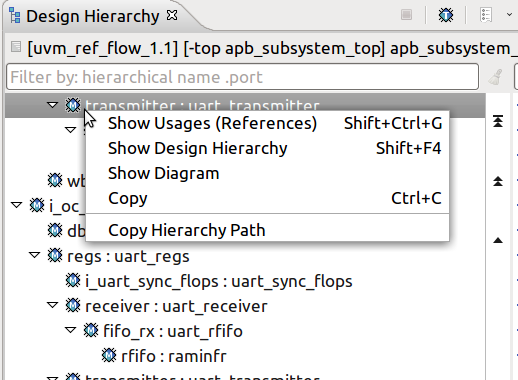 Copy Hierarchy Path Copy the hierarchy path of the selected port to clipboard. You can change the segment separator from Window > Preferences > DVT. 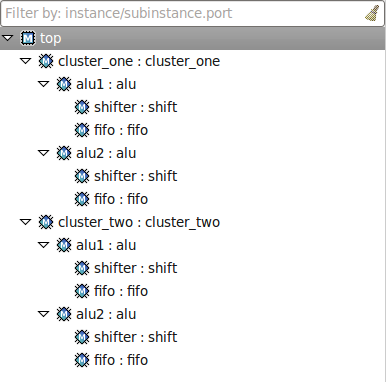 You can use the filters to locate a specific instance or port. 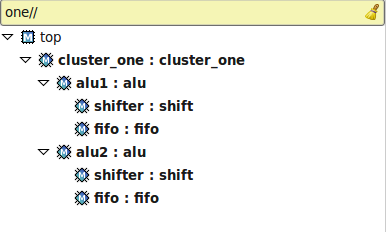 You may use slash '/' characters to filter hierarchically one level and '//' to filter hierarchically all the levels. You may use the dot '.' character to filter instances that contain a specific port. The ports that match the filter are promoted to the top of the ports panel. See Quick Search for more details. 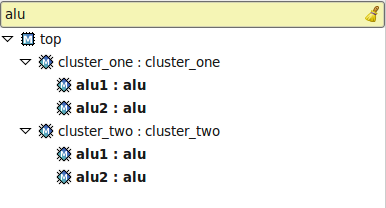 Filter by instance name. All instances that contain the filter text are shown. Filter strict hierarchy. All instances that contain the filter text and are in a direct hierarchical relationship (father/son) are shown. Filter non-strict hierarchy. All instances that contain the filter text and are in a direct or indirect hierarchical relationship (ancestor/../../descendant) are shown. Filter strict hierarchy and show all descendants. Same results as for filter strict hierarchy, but including all descendants of the matched instances. Filter strict hierarchy and show direct descendants. Same results as for filter strict hierarchy, but including the sons of the matched instances. Filter by port name. All instances with ports that contain the filter text are shown. Filter by hierarchy and port name. Hierarchical filtering and port filtering may be combined.